One day last August seven thousand people gathered at Aquidneck Park, near Newport, to see what American chauffeurs could do. The track was only a half mile long, and the turns were short and without protect­ing banks. Yet the auto cars were driven around at speeds that would have done credit to railroad en­gineers. Interest cen­tered in the closing races, for vehicles de­veloping more than twelve horse power. The first of these events was a match between Foxhall Keene and David Wolfe Bishop. Both rode Morse machines of French make, and Keene's is said to develop sixty horse power. At the sound of the pistol Keene leaped to the front at once, and forged ahead so rapidly that he lapped his op­ponent, being half a mile in advance before four miles had been run. The five miles were covered in two seconds over eight minutes. This heat was, exciting enough, but it did not compare with the one that fol­lowed between William K. Vanderbilt, Jr., and William N. Murry of Pitts­burg. 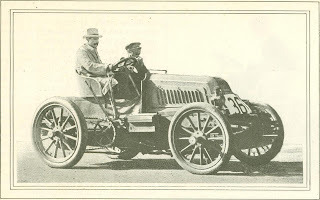 Mr. Murry's mount was a forty horse power Winton, said to be the strongest American machine yet node. 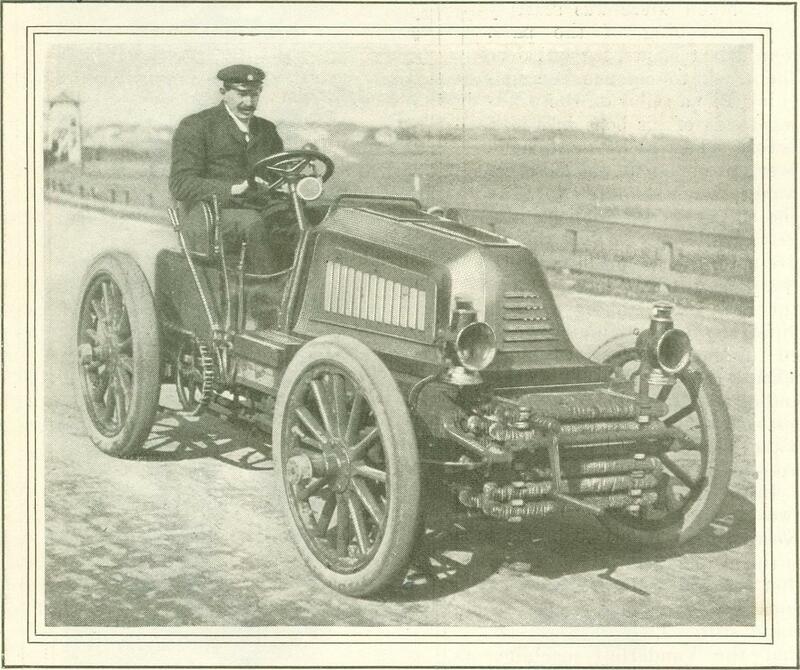 Mr. Vanderbilt rode his famous new Red Devil, which is a Daimler, of German make. When the pistol sounded, the Red Devil shot forward from a dead stand as if fired from a can­non, the entire strength of the enormous power being applied at once. How steel could stand the strain none who witnessed it understood; but it did, and the automobile rushed forward with a speed that made it almost in­visible in the cloud of dust. Even when the sharp corners were taken there was scarcely any slackening of the pace. The driver leaned far out over the track to balance the ma­chine, like a sailor on the wind­ward side of his boat in a stiff breeze. Fast as he went, how­ever' his opponent was close be­hind. Murry lost a few yards at the start, but he hung on like grim death, and for half of the five miles the two machines kept the same distance apart. Then the Red Devil, taking a fresh burst of speed, gradually open­ed the gap, yet so slowly that when it crossed the tape at the end of the fifth mile Murry was less than five seconds behind. Vanderbilt's time was 7 min­utes and 43 1-2 seconds. In the third five mile race the two winners, Vanderbilt and Keene, came together. Again at the pistol crack the Red Devil shot forward, while for two sec­onds Keene's vehicle seemed to stand still. Then it was seen that the Vanderbilt machine, swift as it was during the first race, had been held in, for it covered the five miles in nearly seven seconds less time, the new record being 7 minutes, 36 3-4 seconds, and better by nearly eleven seconds than Mr. Keene's time. Consequently for another year Mr. Vanderbilt holds the championship under the New­port rules. Last year he rode his White Ghost, his best time being about nine minutes. Last summer and fall some record breaking short distance runs were made in and near New York. 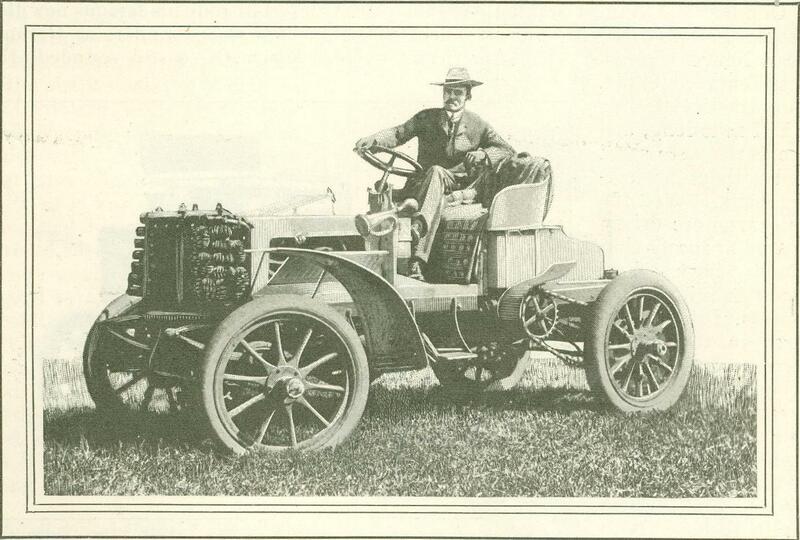 On July 5, at Elkwood Park, near Long Branch, Mr. Albert C. Bostwick, with a forty horse power American machine, did a mile in 1 minute, 16 3-4 seconds, and three miles in 3 minutes, 52 1-2 sec­onds. On October 10, at the Empire City Track in Yonkers, Henri Fournier, the French professional, cut the time for a mile to 1 minute, 6 4-5 seconds. 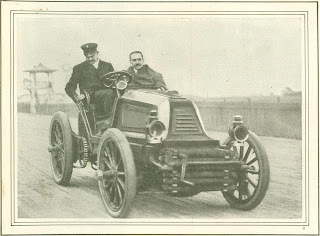 Two weeks later Mr. Alexander Winton; in a trial at Detroit, beat Fournier's record by two fifths of a second; but on Novem­ber 16, with the advantage of a straight­away track—the Ocean Parkway, in Brooklyn—the Frenchman regained his supremacy, his time for the mile being 51 4-5 seconds. On the same day Mr. Foxhall Keene did the distance in 54 2-5 seconds, and Mr. Bostwick in 56 2-5 sec­onds. The best long distance records have been made in France. The first great road race was held there in 1394, instituted by Le Petit Journal, of Paris. It was a speed trial from Paris to Rouen and re­turn, about seventy five miles each way. Though more than a hundred machines were registered, only fifteen started. 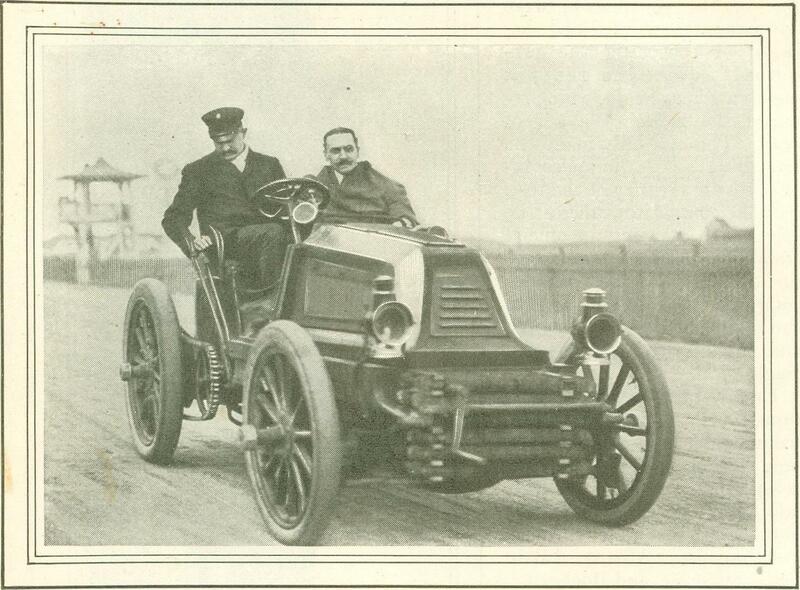 The race was won by a Daimler gasoline motor in 5 hours and 40 minutes, an average of about thirteen miles an hour. In the following year there was a race from Paris to Bordeaux and return, ap­proximately seven hundred and ten mites. Of the twenty eight machines that started, twelve reached Bordeaux, and nine of these returned to Paris. The best time was made by M. Levassor in 48 hours, 48 minutes, an average of about fourteen and a half miles an hour. In the race of 1898 M. Rene de Knyff made the trip from Paris to Bordeaux in 15 hours and 15 minutes. M. Char­ron won the following year in 11 hours, 4 minutes and 20 seconds. The race this year, held on May 29, fell to Henri Fournier. The course was three hundred and forty eight miles long, from Paris to Bordeaux, eighteen miles being through cities, where the speed was limited to seven and a half miles an hour. Fournier made the entire dis­tance in 8 hours, 44 minutes, and 44 sec­onds. His three hundred and thirty miles outside of towns was taken at an average of fifty three miles an hour, and the entire distance, including the eigh­teen miles of slowing up through towns, at more than forty miles per hour. Some portions of the journey Fournier doubtless made at more than seventy miles an hour. The famous Sud express, said to be the fastest train in Europe, takes an hour longer to make the trip. Remember that this speed was made on a country road, without guiding tracks for the wheels, and with no bar­rier from death save the arm and nerve of him who sat for nearly nine hours steering his car at that terrific pace. A ton of steel mechanism, driven at a mile a minute, upturned by an obstacle from its course, would not slide gently along a few feet and come to a safe stop. Rather would it go end over end, with a crash that would wreck the machine and its occupants beyond probable re­pair. Yet the modern hero of the road, facing these imminent dangers, which none realizes better than he, drives his car on hour after hour without a falter. The race belongs not surely to the swift, but to the strong man of steady hand and unfailing nerve at the lever. The most remarkable long distance race so far attempted was that in June last from Paris to Berlin. The plan at first was to interest all Europe by or­ganizing a long distance contest from Paris to St. Petersburg; but it was found practically impossible to race through Russia, so Berlin was made the objective point. A course running for seven hundred and forty four miles, and through more than fifty towns, required the most careful supervision to provide for the safety of the public and of the participants. An army of police officers lined the way. Manufacturers posted mechanics all along the route, gasoline firms forwarded thousands of gallons of spirit, while spare tires by the score were in readiness at all the towns. One manufacturer is said to have expended more than a hundred thousand dollars. The start was made at Champigny, a few miles east of Paris, in the early morning of June 27. The first car was sent off at half past three, and others followed at intervals of two minutes. Among the towns passed through were Reims, Aix la Chapelle, Cologne Munster, Hanover, Madgeburg, and Pots­dam. Forty nine vehicles out of one hundred and ten starting made the en­tire journey, while this new invasion of the German Empire was met, not with hostile guns, but with triumphal arches, flying flags, the plaudits of the people, and the blare of welcoming music. Again Fournier was the leader. His running time for the entire distance was 16 hours and 6 minutes, which meant an average speed of more than thirty nine miles an hour. Earlier in the week, along a different course between the two capitals, an en­durance trial was run, not of racers, but of tourists. Speed was restricted both• through towns and in the open country, and six days were allowed in which to complete the journey of seven hundred and fifty eight miles. It speaks, vol­umes for the durability of the machines used that of the fifty one starting from the city on the Seine, forty one arrived at Berlin within the time limit. Many consider these endurance con­tests far more valuable than racing as tests of the real efficiency of an automo­bile, since they bring out the strength and weaknesses of the machines under conditions of more general experience. Most automobilists do not want a vehi­cle that can make sixty miles an hour, but one that will run for hours and days together without a breakdown. Such was the purpose of the Glasgow trials in Scotland during the first week in September last. Six routes were laid out from that city as a center, each of from eighty to ninety miles, and one for each day of the week. All stops other than those compulsory through traffic, or because of tire difficulties, counted against the vehicles. Probably the most searching of all such contests was the run in Long Island on April 20 of last year. The course was laid out a hundred miles long, covering all varieties of road. Speed was limited, and two of the contestants were subsequently disqualified be­cause of exceeding the pre­scribed pace. The run was made in a heavy rain, which re­duced the roads to a sea of mud. This not only made the trip disagreeable, but also in­creased the severity of the test. Fifteen competitors made the start, each carrying an official timekeeper, besides the opera­tor. Nine of the number completed the journey within the required time, eight hours, and two of these made not a single stop. Under very similar condi­tions the Pan American Expo­sition contest was made, begin­ning on September 9, the route being from New York to Buf­falo, four hundred and sixty four miles, passing through Poughkeepsie, Albany, Little Falls, Syracuse, and Rochester. Each of these cities was the end of a day's run, the average daily distance being about eighty miles. The vehicles were classified into five groups, according to weight, and cer­tificates were awarded accord­ing to the average speed shown for the entire run. On ac­count of the death of Presi­dent McKinley the contest was closed on September 13 at Rochester, three hundred and ninety four miles from New York. It was estimated that there were but fifty miles of good road in the entire route. Of automobile carriages proper, eighty one left New York. Sixty seven of these went beyond Albany, but the number was narrowed down to fifty one at Syracuse, and only forty one reached Rochester. Of the fifty four gasoline motors start­ing, exactly half completed the journey. The record for the steam carriages was fourteen out of twenty seven starting. Two wheeled motor cycles to the num­ber of three began the contest, and one got as far as Syracuse. There were also three delivery wagons, one of which succeeded in reaching Herkimer. Interesting as these various contests are to the automobile devotee, the gen­eral public has a disagreeable habit of asking what it is all forth. Not so many years ago everyone had to ride a bicycle if he wanted to be in the fashion; but today thousands of wheels are lying in rust and dust. Will this new craze go the same way? It must be confessed that the visions pictured by the automobilist are attract­ive enough, even to the novice—a vehicle always ready for service at an instant's warning, speedier and more, re­liable than the horse, never tiring, how­ever steep the hill or bad the road, and all within the reach of the family of modest means. But not even the most ardent lover of the sport can say that this ideal is yet in sight. The uninitiated enthusiast pores over the fascinating parallel columns of com­parative costs between the horse and the motor vehicle until he can hold out no longer. His bank account is poorer by one to three thousand dollars, and his stable richer by an automobile. He tastes the joy of a spin at fifteen miles an hour along country roads, with his own hand on the lever, and feels that life has little higher pleasure to offer. But suddenly the machine begins to miss the rhythmic beat. He turns a screw, and then another, only to make the matter worse. The car comes to a dead stop, and refuses to budge. After the enthusiast has worked two or three hours in vain under the hot sun, and fi­nally has had the vehicle ignominiously towed home by a pair of horses; after he has written liberal checks in payment of repairs, and has replaced a number of costly pneumatic tires, his enthusiasm begins to ooze. The ideal may be all right, but the real is not so good. Driving a horse and driving an auto­mobile are two very distinct propositions. The horse, as someone has said, takes his brains with him, while the brains of the automobile are left in the machine shop. It is all very well to say that anyone who can drive a nail can drive an automobile, but unless a man has pa­tience, perseverance, and mechanical in­genuity he would better leave the motor carriage to someone else. 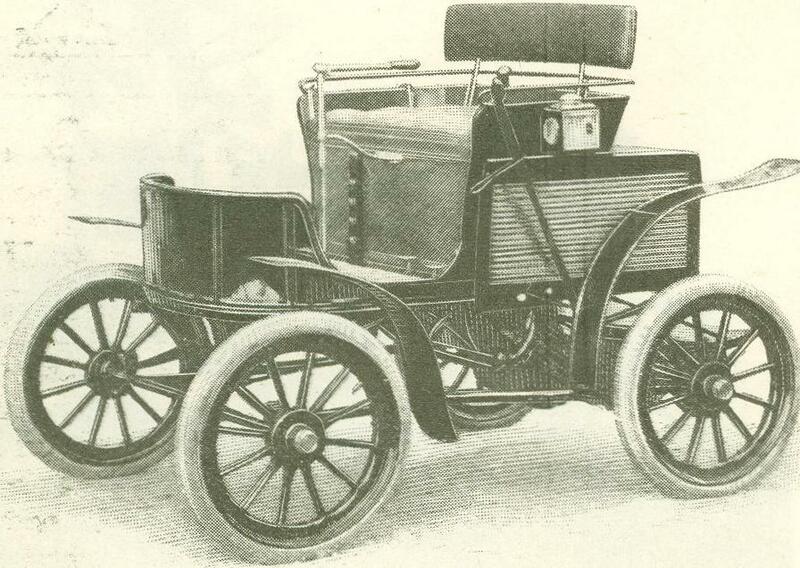 Whether even at its best the automobile will ever become so simple as to be "fool proof" is extremely doubtful. The truth is that the industry of ma­king these vehicles is still in the experi­mental stage, and is likely to remain so for several years. So complicated are some of its problems that it is going to take the best brains of the world for their solution. If a cheap and powerful electric battery could be produced—more efficient even than that announced by Mr. Edison—everything else would follow. 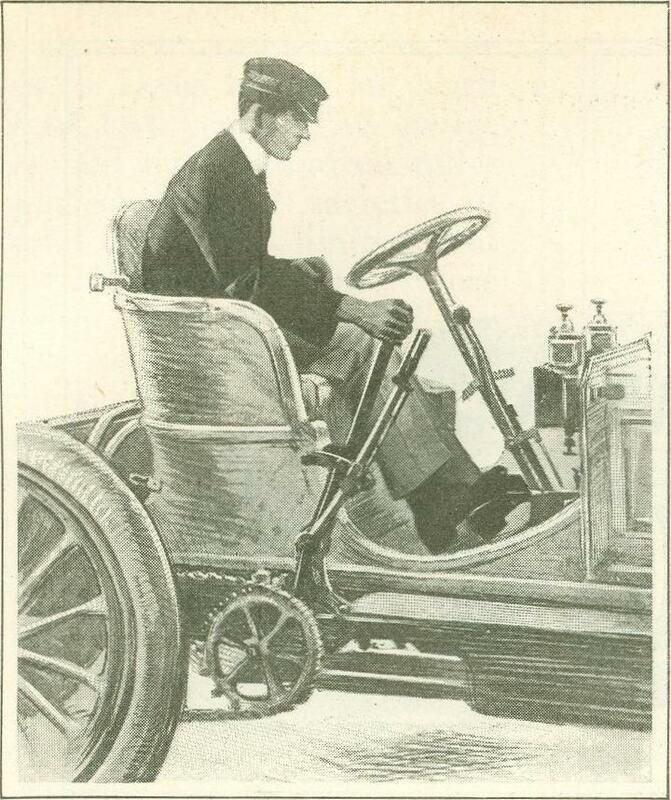 Today the electric automobile is practically perfected; but its owner must carry a ton of battery cells and re­strict his journeys to thirty miles from the source of supply. Moreover, he must wait from three to six hours for his batteries to be recharged. But for smoothness of service and ease and cer­tainty of operation, no power equals electricity. Nearly all the long, fast runs have been made with gasoline motors. Their advantages are that they are light and powerful, while the spirit is on sale at almost every crossroads. Only the ini­tiated, however, appreciate the total de­pravity of the gas engine even in the hands of the expert. To the Man of or­dinary mechanical ability, its eccentrici­ties are often beyond understanding. And then there are problems of tires, problems of gear, of wheels, of frame, all vexatious alike to maker and user. During seven years of practical experi­ence, long strides have been made to­wards their solution, but perfection is still far off. Recent tests in France, in England, and in America have shown how some machines can be driven five hundred or even a thousand miles with­out serious breakdown—a thing practi­cally impossible three or four years ago. Each season brings a better machine, a closer approach to the vehicle that is simple and strong enough for any man or woman of sense to drive with com­fort, speed, and certainty. But it would be premature to sound the funeral knell of the horse. That useful animal has withstood the attacks of the bicycle and the trolley, and the yet more dangerous assaults, half a cen­tury ago, of the locomotive. He may come out of the automobile conflict equally unharmed. Those-who love him for his own sake will never consent to supplant him with a mere human crea­tion of steel. from Junior Munsey, March 1902.